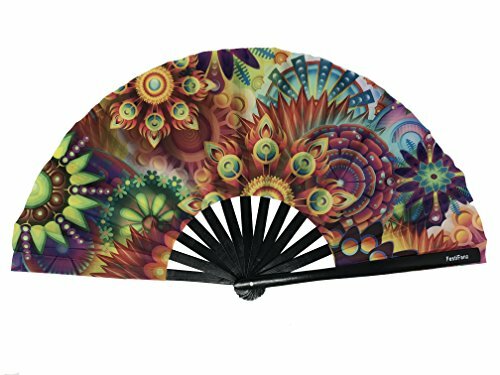 FestiFanz Large Lucy's Dream Folding Hand Rave Fan Festival Fan by FestiFanz at Home Decor Outlet Store. Hurry! Limited time offer. Offer valid only while supplies last. his hand fan is made of high-quality bamboo and smooth water-resistant printed nylon fabric. Fans are 13-Inches long and 23-inches when opened fully. his hand fan is made of high-quality bamboo and smooth water-resistant printed nylon fabric. Fans are 13-Inches long and 23-inches when opened fully. These hand fans are great for outdoor and indoor events. If you have any questions about this product by FestiFanz, contact us by completing and submitting the form below. If you are looking for a specif part number, please include it with your message.